When the Spanish founded Mexico City in the 16th century they built everything on top of Tenochtitlan, the capital of the Aztec Empire. In the city’s Historic Centre there are Baroque monuments constructed with recycled pre-Columbian blocks, and the excavated ruins of the Templo Mayor sit beside the cathedral and National Palace. This sums up Mexico City, as a fusion of European and indigenous culture, visible in the art of Frida Kahlo who was born and died in Mexico City, and the magical murals by her husband Diego Rivera. The Palacio de Bellas Artes has pre-Columbian motifs rendered in an Art Deco style, while if you want to immerse yourself deeper in these historic roots head straight for the National Anthropology Museum and the monumental city of Teotihuacan just beyond Mexico City’s limits. 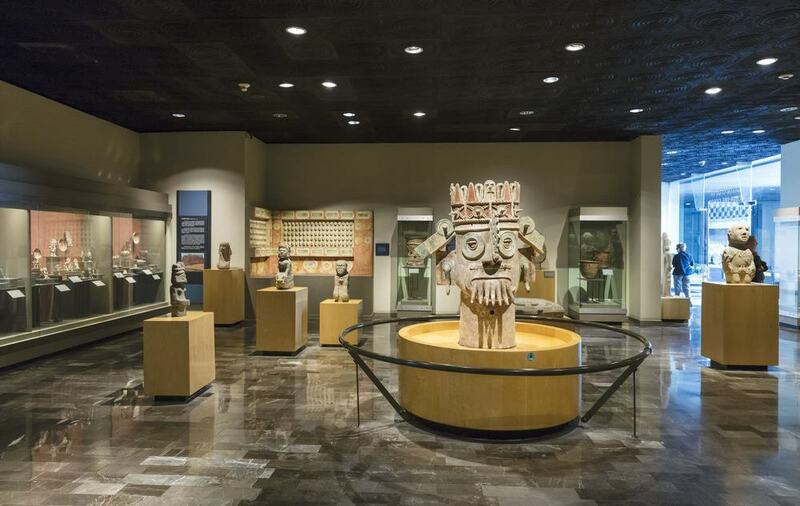 The place where you can feed your curiosity for Mexico’s pre-Columbian cultures, the National Anthropology Museum is rich with artefacts and anthropological exhibits spanning millennia. More than a trip into Mexico’s past, the museum cuts to the core of modern Mexican identity and pays tribute to its indigenous people. There’s in-depth information and artefacts (reliefs, statues, murals and much more) for every pre-Hispanic culture on Mexican territory, including the Olmecs, Mayans and Aztecs. Don’t leave without seeing the world-famous Aztec Sun Stone, an intricately carved calendar stone, weighing 20 tons and with an image of the sun god Tonatiuh at its centre. The museum is also the place to investigate Tenochtitlan, the Aztec city demolished by the Spanish to make way for the modern capital. 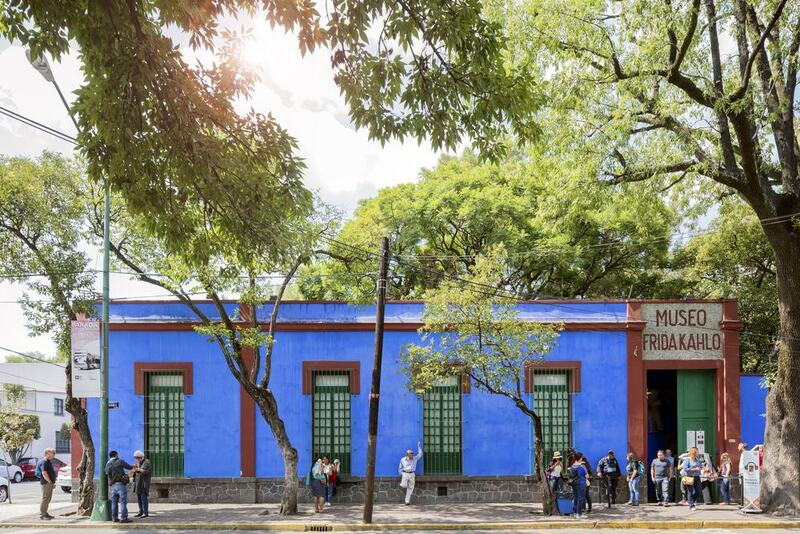 Also known as the Casa Azul for its cobalt-blue walls, the Frida Kahlo Museum is the home of one of Mexico’s most famous artists. She was born at this building in the Coyoacán borough, grew up here, shared it with her husband Diego Rivera and passed away in a room on the upper floor in 1954. Except for the glass cases put up around some exhibits, the house has been kept as it was in the 1950s and has a miscellany of items like traditional Mexican cookware, pre-Columbian artefacts, art by Diego Rivera, Paul Klee and José María Velasco, and “Judas” papier-mâché figures used in traditional Mexican celebrations. Upstairs are Kahlo’s studio, flooded with sunlight, and the room she passed away in. Entrance is free on Sundays. On other days, book tickets online to avoid the queue, which can trail down the street. At the top of the rocky Chapultepec Hill in the namesake forest, the palatial Chapultepec Castle was begun in 1783 and is the only castle in the Americas existing from the days of New Spain. 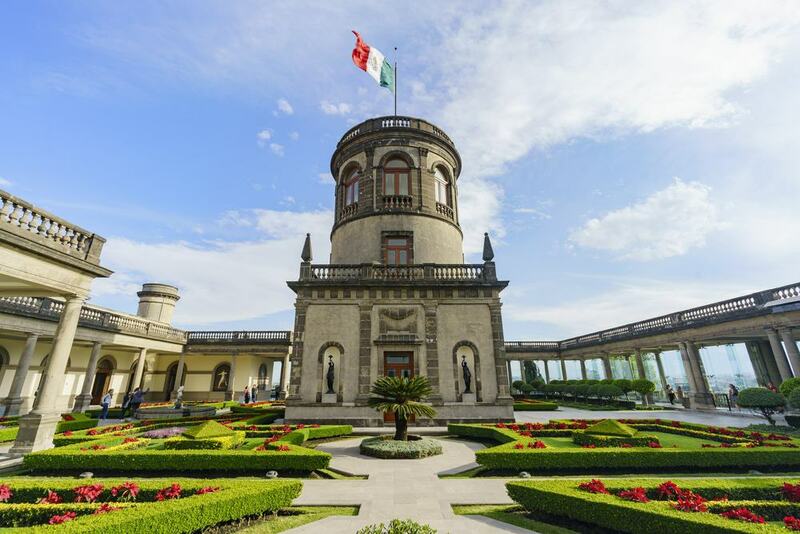 A kind of Mexican Versailles, with formal gardens and sumptuous views of the city from terraces, Chapultepec was a summer residence for the Viceroy and after the revolution became the seat of Emperor Maximilian I. Over the last 240 years the complex has been an observatory and military academy, and today houses the National History Museum, full of weapons, murals, maps and artefacts like the Imperial Coach. You’ll take a self-guided tour of the palace interiors, embellished with stained glass, damask wallpaper, portraits, musical instruments and furniture from the royal and imperial periods. At 686 hectares, the green space enclosing the castle is on the list of the largest urban parks in the world. The Bosque de Chapultepec was a green escape long before the Spanish arrived, and was a sanctuary for Tenochtitlan’s Aztec rulers. Amid the cedars, sequoias, poplars and palms are a host of visitor attractions like the Chapultepec Zoo, the Rufino Tamayo Contemporary Art Museum, and of course the National Anthropology Museum. 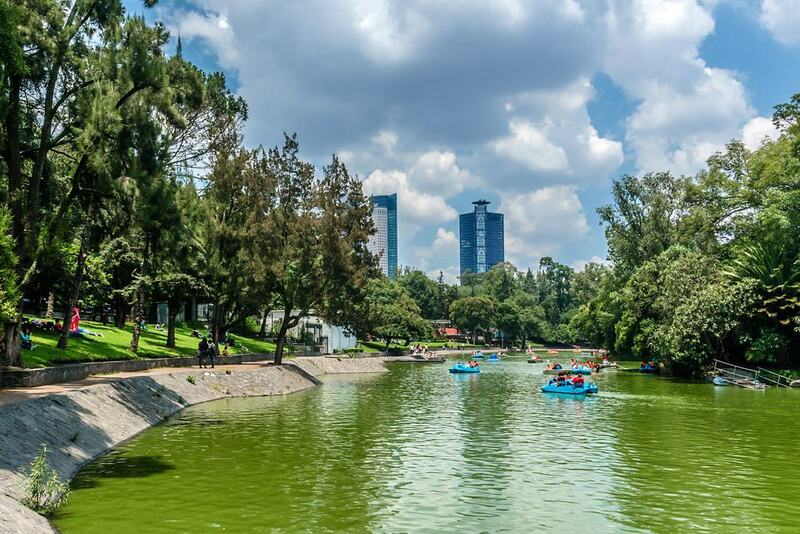 Naturally, you can take part in typical park activities, like picnics or boating around the Lago de Chapultepec. Botanically-minded people might try to locate the park’s oldest trees, which are all Moctezuma Cypresses, dating back as far as 700 years and with nicknames like “The Sergeant” and “The Sentinel”. A broad avenue running diagonally through the centre of the city, the Paseo de la Reforma is from the 1860s and was inspired by the grand boulevards in fashion in Europe at the time. The route is flanked by embassies, skyscrapers and also occasional stands selling tacos and tortas. 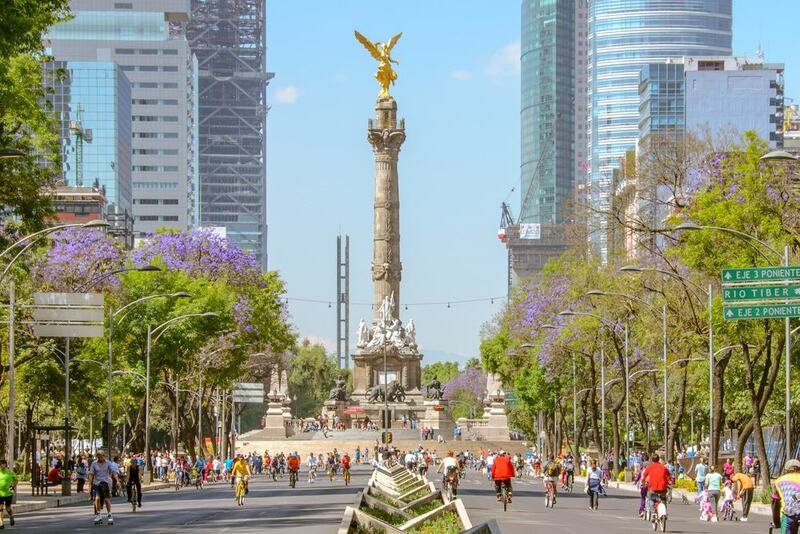 For sightseers there’s no better introduction to the city as the Paseo de la Reforma will lead you right through the Bosque de Chapultepec and passes in front of the National Anthropology Museum. 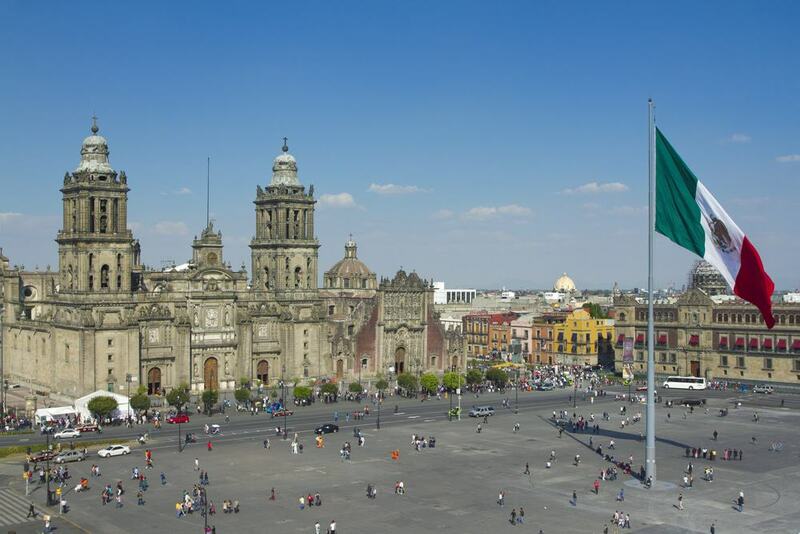 Other must-sees include two major monuments for Mexican national identity: The first is the Monumento a la Revolución, the tallest triumphal arch in the world, erected at the intersection with the Avenida de los Insurgentes in phases in the first half of the 20th century. The spectacular Angel of Independence, hoisted atop a 45-metre column, was raised in 1910 on the 100th anniversary of the start of Mexico’s War of Independence. 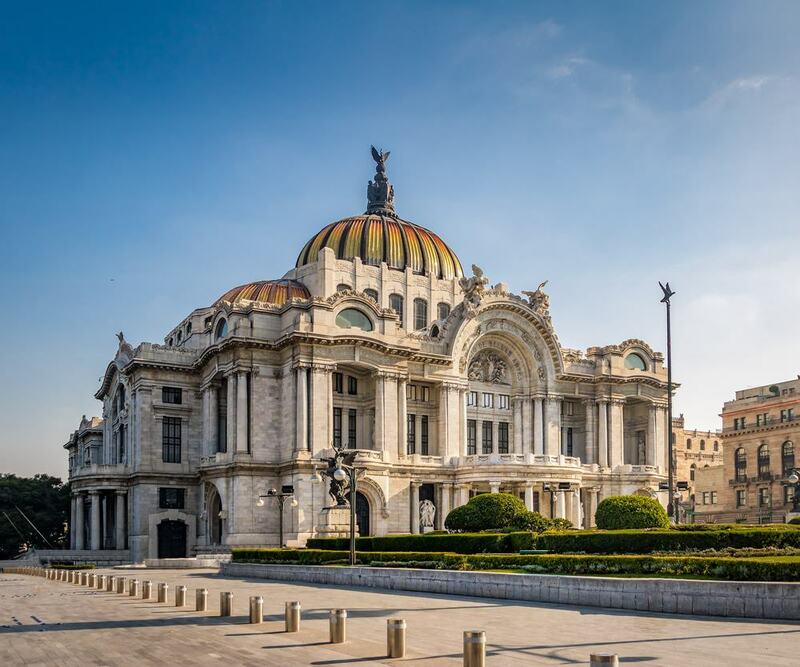 A cultural venue fitting for a capital, the Palacio de Bellas Artes is a stirring Historicist and Art Nouveau monument on the east side of the Alameda Central park. While the building was started in 1904, construction was delayed in 1913 and wouldn’t be resumed until the early 30s. So the interior has a later Art Deco design, calling on pre-Hispanic motifs like Maya Chaac masks on light fittings and serpents’ heads on window arches. To really appreciate the full splendour of the auditorium, which has an incredible glass curtain designed by Tiffany’s, you have to come for a performance, preferably by the Ballet Folklórico de México. 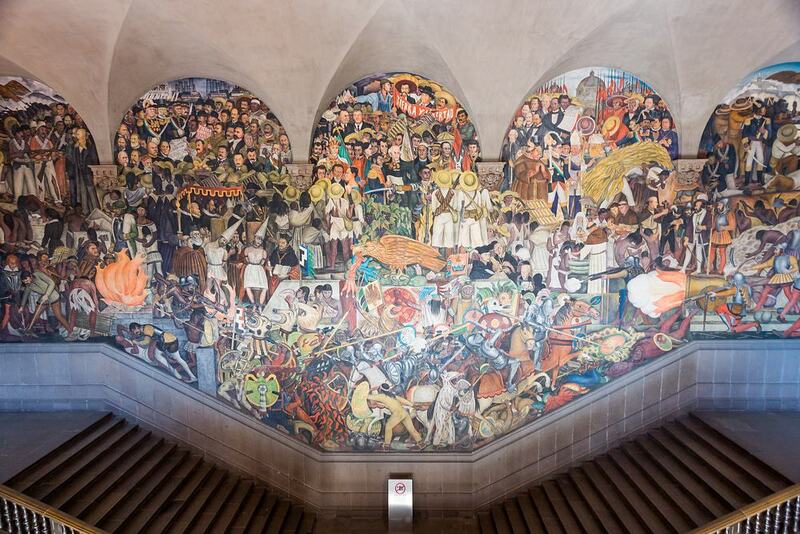 On a typical day, you’ll be able to head to the first floor for murals by Diego Rivera. The southern borough of Coyoacán was a separate settlement to Mexico City all the way up to 1857, and still feels like its own small town. In the 20th century it rose to fame as the home to Frida Kahlo and Diego Rivera, as well as Leon Trotsky who was granted asylum after Kahlo and Rivera petitioned the government. The counterculture flourished here, and Coyoacán is still associated with arty, bohemian types. 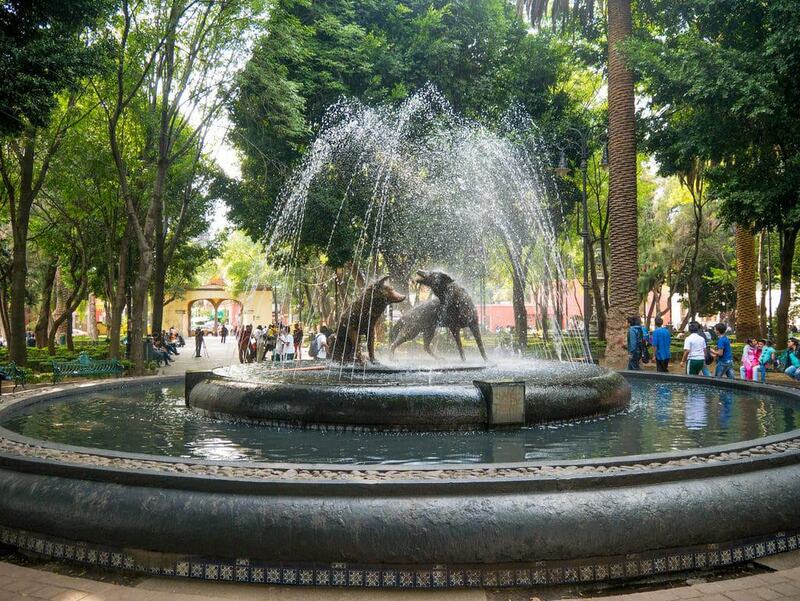 The historic centre of Coyoacán is a mosaic of squares and parks connected by cobblestone streets. It’s somewhere to peruse arts and crafts markets and sample some street food. The central square is Plaza Hidalgo, shaded by Indian laurel trees and palms, and laid with formal gardens traced by low hedges. On Plaza del Centenario close by look for the bronze sculpture of two coyotes, referring to Coyoacán’s name, which means “place of Coyotes” in Nahuatl. 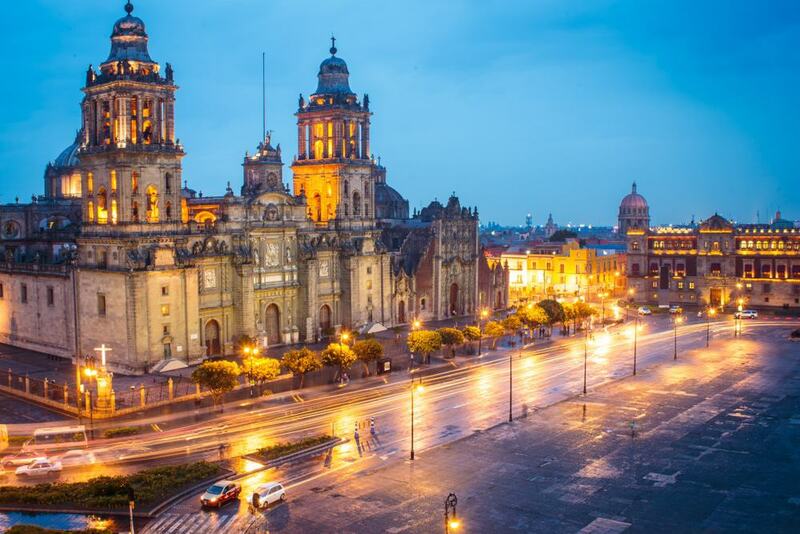 The oldest part of Mexico City is built on an a former island where the Aztec city of Tenochtitlan once stood. This was besieged in 1521 by the Spanish and, once conquered, was completely razed. The lake surrounding Tenochtitlan was drained, which is why the ground under Mexico City is so soft. Many of the monuments in the Historic Centre are on sites that were once important to its pre-Columbian residents: The Cathedral is over the ruins of the main Aztec temple, while the National Palace stands where the palace of the Aztec ruler Moctezuma used to be. 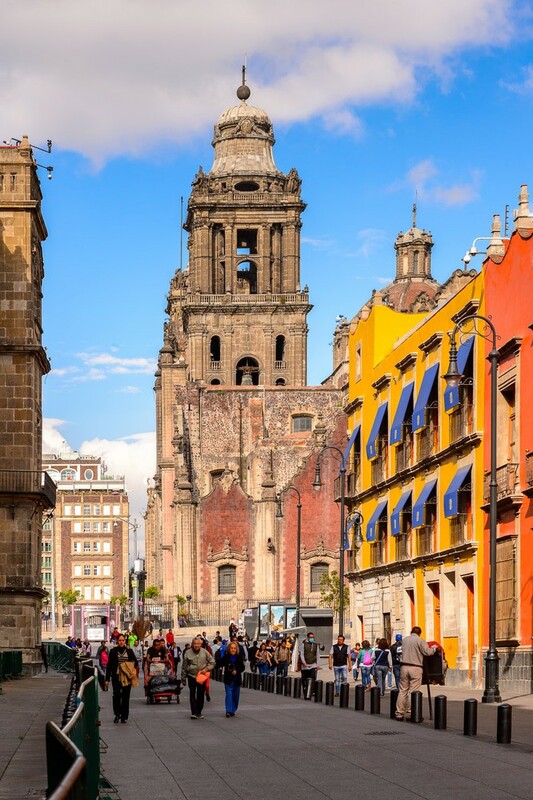 The Historic Centre is a World Heritage Site, full of Baroque and Historicist architecture including churches, palaces (Iturbide, Correos, Inquisición, Arzobispado), many housing museums. Once Tenochtitlan’s ceremonial centre, Zócalo is Mexico City’s main square. The magnitude of this space is hard to put it into words, and it’s the second largest city plaza in the world after Red Square in Moscow. To the north is the Cathedral of Mexico City and on the eastern frontage is the National Palace, both of which we’ll talk about shortly. And just as indigenous Mexica ceremonies took place at the Zócalo before the Spanish arrived, it’s now Mexico City’s main gathering point for celebrations on Mexican Independence Day (El Grito on the night of 15 September), Corpus Christi and Holy Week. Down in the square’s metro station you can view scale models showing how Zócalo looked before the conquest, as well as its evolution over the last 500 years. 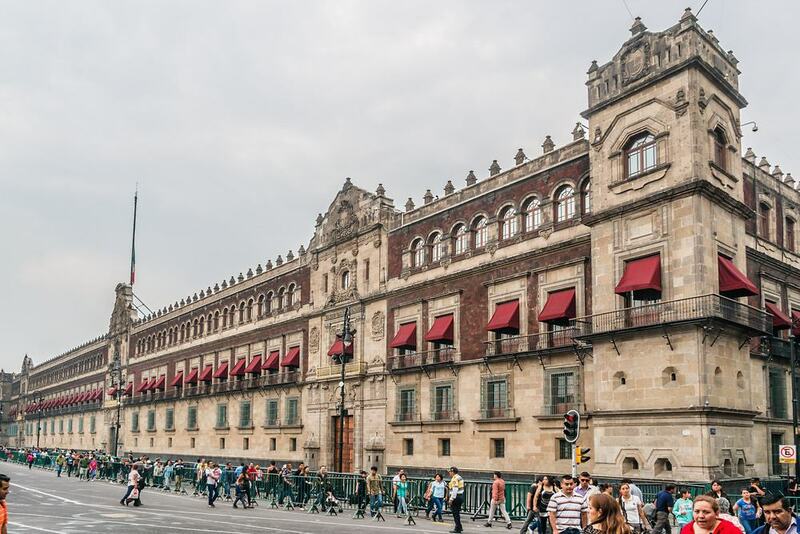 Filling the whole eastern boundary of the Zócalo is the facade of the National Palace, which has the iconic balcony where the president gives the Grito de Dolores (Cry of Dolores) in honour of Mexican independence. When you’re staring at this mammoth complex started in the 16th century for the conquistador Hernán Cortés, you may get a thrill to consider that it was partially built with stone from Moctezuma II’s Aztec palace that was here before. Be sure to head through the central portal to see the botanical garden and Grand Courtyard. Up the steps are spellbinding murals by Diego Rivera, which we’ll come to later. Built over the ruins of the Aztec sacred precinct next for the Templo Mayor, the Cathedral went up in stages from 1573 to 1813. The plan was drawn up by the Spanish architect Claudio de Arciniega and takes cues from the Late Gothic churches in Spain. Covering 6,732 square metres it’s the 28th-largest religious building in the world. And because of that lengthy construction period, the Cathedral is a medley of styles including Gothic, Renaissance, Baroque and Neoclassical. Inside it could take hours to see all of the 16 chapels, the pair of 18th-century organs, the glorious Gothic and Renaissance sacristy and the opulent Altars of the Kings and of Forgiveness. 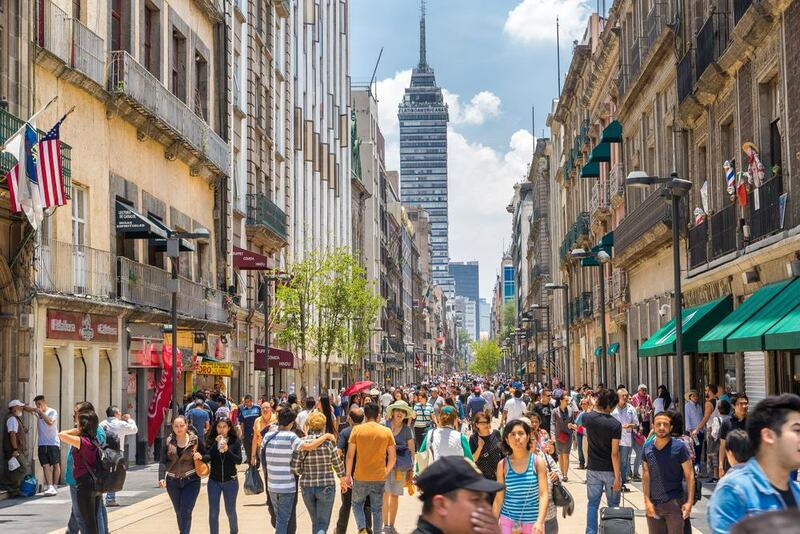 East to west between the Torre Latinoamericana and Plaza de la Constitución, Calle Madero is a pedestrianised street in the Historic Centre, mixing shops with historic mansions and churches. The street was only closed off to road traffic in the early 2010s, a project that was first greeted with scepticism but is now celebrated. Some things to look out for are the Casa de los Azulejos (House of Tiles), modelled in 1793 and coated with blue and white tiles fired and painted in the state of Puebla. With a richly sculpted facade, the Church of Francisco is a Baroque monument from the 17th century, and the last remnant of a Franciscan monastery. The Jesuit Temple of San Felipe Neri goes back to the 1500s and its architecture blends the understated Baroque style of the 1600s with the more exuberant ornamentation from the century that followed. 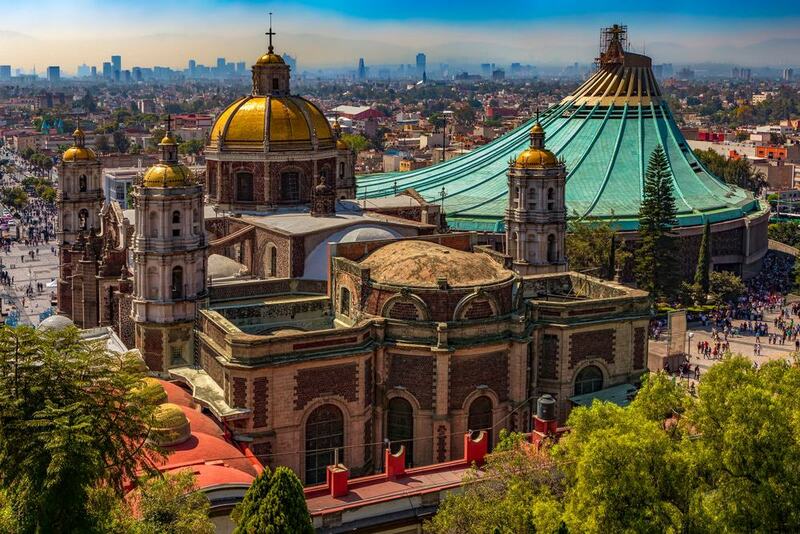 Mexico’s national shrine is one of the most visited places of Catholic worship in the world. On the Marian Square of the Americas, it is set near the Tepeyac Hill, where Juan Diego, the first indigenous saint on the American continent, is claimed to have witnessed Marian apparitions on four occasions in December 1531. There are two basilicas on the square. The older dates to 1709, but needed to be replaced in the mid-1970s when it was found to be sinking, and has opened again only recently after foundation repair. Consecrated in 1976, the circular modern basilica is 100 metres in diameter, with a capacity for 10,000 worshippers. That round layout allows you to see the image of the Virgin from any angle, while the most venerated relic is the cloak of Juan Diego, which survived a bomb attack in the old basilica in 1921. South of Mexico City, Xochimilco is a borough most famous for its World Heritage canal system. 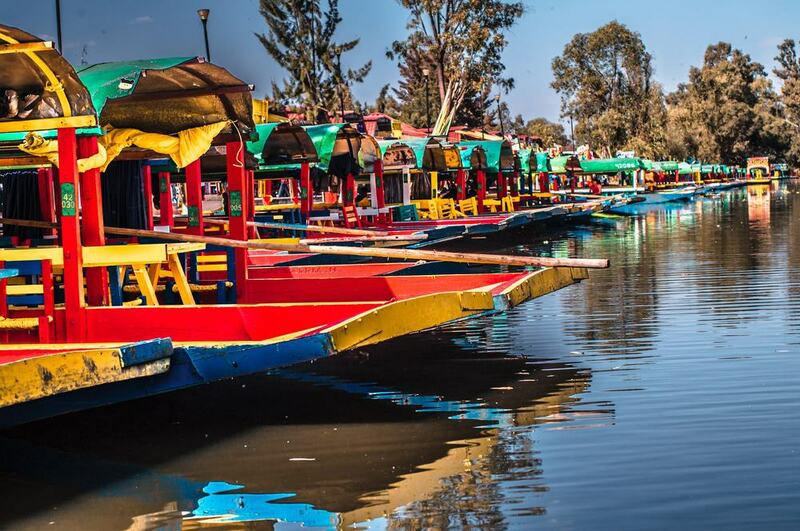 These waterways have historic roots and have been used to transport goods for hundreds of years, since the foundation of Xochimilco as a pre-Columbian city. Now, a ride on one of the flat-bottomed trajineras is a touristy but essential experience. These craft are garishly painted and take you past chinampas (floating gardens), many of which are cultivated for vegetables and flowers. After an hour or so on the water, passing gondolas selling food and drink, carrying mariachi bands or pumping out music from speakers, you’ll come to the unnerving Isla de las Muñecas (Island of the Dolls), where hundreds of dolls hang from the trees. 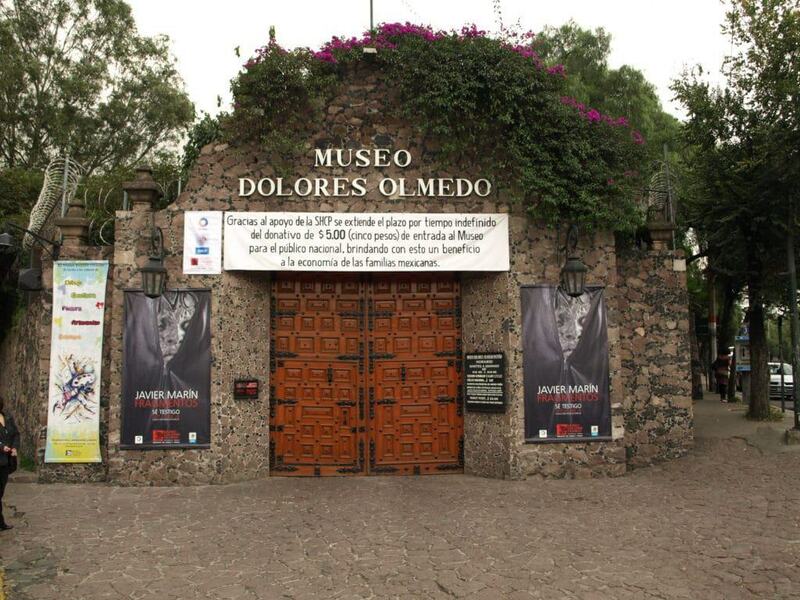 In 1962 the businesswoman and philanthropist Dolores Olmedo acquired a 16th-century hacienda in Xochimilco, which she would later convert into a museum. To do this she donated her extensive art collection, made up of more than 6,000 pre-Columbian figurines, as well as numerous paintings by 20th-century luminaries like Frida Kahlo, Diego Rivera and Angelina Beloff and installation art by Francisco Guevara. A newly opened wing presents Olmedo’s personal possessions like porcelain and pieces of carved ivory. Being an Hacienda, the grounds are a delight, with manicured gardens and free-roaming peafowl. The museum also runs a small menagerie, with ducks, geese and Xoloitzcuintlis (Mexican hairless dogs). The frescoes painted by the 20th-century artist Diego Rivera remain a big part of Mexico City’s identity. Frida Kahlo’s husband was a major talent in his own right and was a master at painting murals. There are four that you should keep in mind. The obvious starting point is the museum established to host one of his murals, Dream of a Sunday Afternoon in Alameda Central Park, at the Museo Mural Diego Rivera. On the steps around the courtyard at the National Palace is an enormous mural telling the history of the nation, painted from 1929 to 1935. There’s another spectacular work in the courtyard of the Secretaría de Educación Pública, showing rural life in Mexico. Lastly, the mural museum on the first floor of the Palacio de Bellas Artes features a version of a mural painted for New York’s Rockefeller Center which was destroyed in 1934 because of its strong references to Communism. The campus built in the southern Coyoacán borough for the National Autonomous University of Mexico in the 1950s became a UNESCO site in 2007. During its construction it was the largest architectural undertaking in the country since the days of the Aztecs. Not just a place to study, the Ciudad Universitaria is a prized hangout for the whole city for its gardens and patios. As you walk its twisting paths and admire the public art, it’s a small thrill to remember that the surface beneath your feet is lava from an eruption by the volcano Xitle in the 2nd century AD. The pavement and many of the walls have simply been carved from this dark rock. 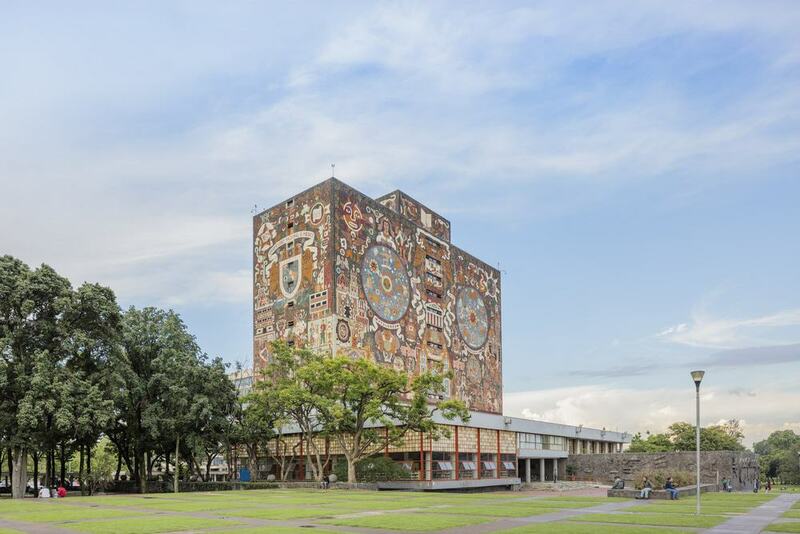 Check out the contemporary art in the sculptural space and the epic murals on the Rectorate Tower and Central Library, by the 20th-century artists David Alfaro Siqueiros and Juan O’Gorman respectively. 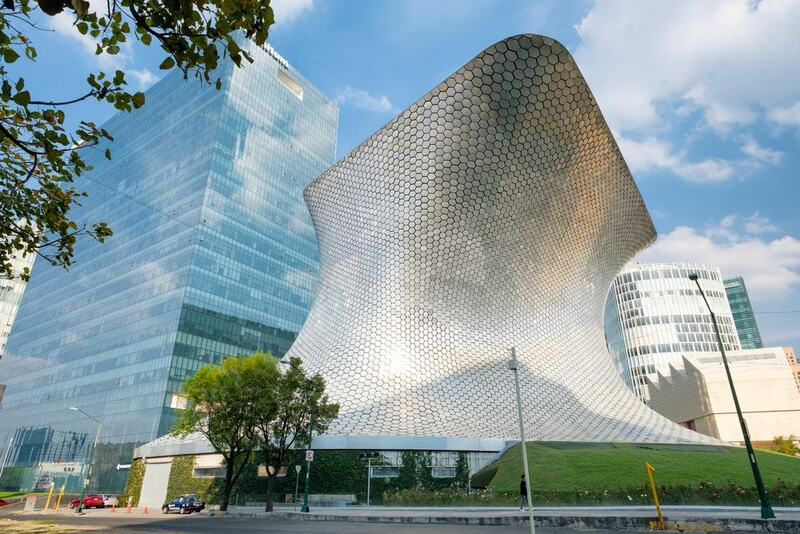 The most frequented art museum in Mexico, the Museo Soumaya was founded by the country’s richest man, Carlos Slim, and moved into a striking new building, clad with hexagonal metallic tiles, on Plaza Carso in 2011. The museum was originally established in the early-90s and is named for Slim’s wife Soumaya Domit, who passed away in 1999. Inside is a vast and varied collection of art spanning 3,000 years. There’s Mexican painting from the 19th and 20th centuries, Pre-Hispanic Mesoamerican sculpture, as well as European art from all eras, by Murillo, El Greco and Tintoretto, through to van Gogh, Monet, Matisse, Miró and Picasso. Slim owns more than a 100 works by Rodin, many on show at the museum, along with a host of sculptures by Dalí. 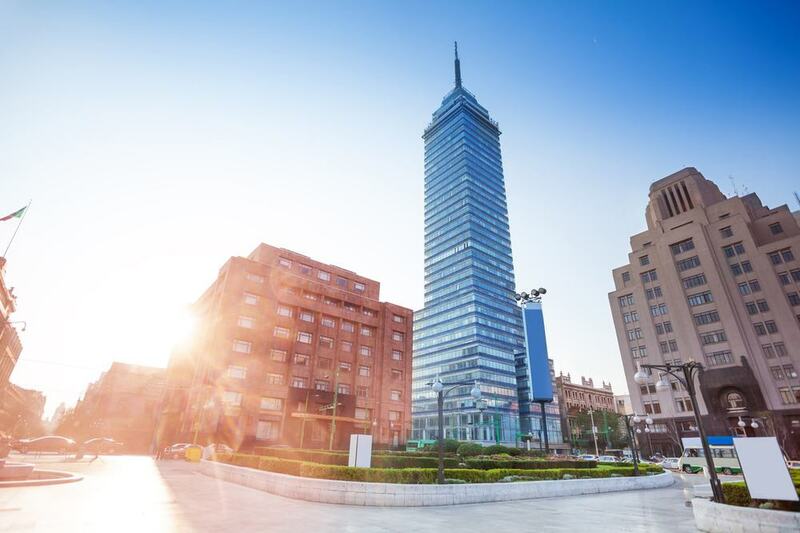 At the corner of Eje Central and Calle Madero, Torre Latinoamericana has been a resilient presence in Mexico City since 1956. At 204 metres high, including its spire, it was the tallest building in Latin America when it was completed. Due to the constant seismic activity in the capital the tower was given an innovative steel frame and has piles deep in the muddy soil. No more than a year after it went up it withstood a destructive earthquake, and then an even more powerful one in 1985 that toppled many of the buildings around it. Part-owned by Carlos Slim, the building has appeared in Iñárritu’s Amores Perros and the Bond movie, Spectre. From the observation deck you’ll have clear views of the Historical Centre and the mountains and volcanoes bordering the city. 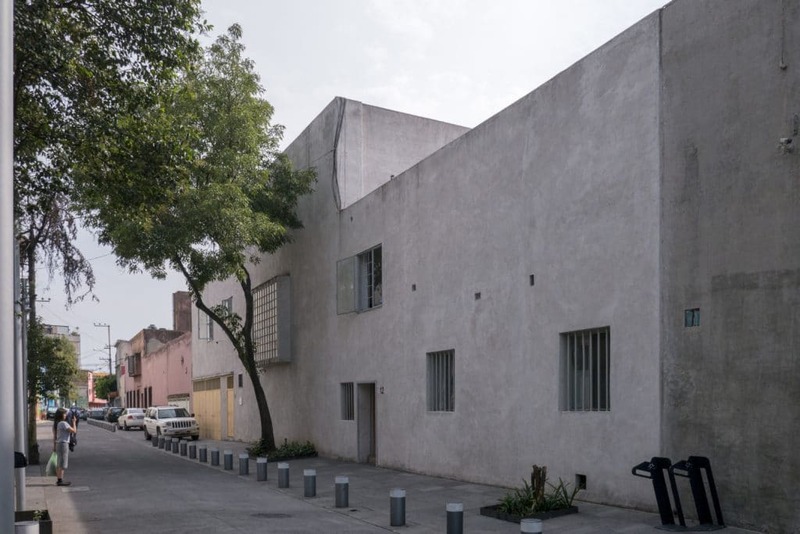 Past the southwest corner of the Bosque de Chapultepec, in the Tacubaya neighbourhood, is the UNESCO-listed house and workplace that the Pritzker Prize-winning architect Luis Barragán designed for himself in the 1940s. Barragán lived and worked here from that time until his death in 1988 and was in a constant state of flux, as somewhere for the architect to try out new ideas. From the street the concrete facade is severe, and the house is configured around a lush courtyard garden not visible from the outside. As a landmark for Mexican modern architecture the house itself is the main thing to see, but it also boasts works by Mexican and international artists like Miguel Covarrubias, Diego Rivera, Jesús Reyes Ferreira, José Clemente Orozco and Picasso, collected by Barragán. The astonishing Mesoamerican city of Teotihuacan is in striking distance and is something you have to make time for. At the height of its power in the 1st century Teotihuacan was the largest city in the Americas and the sixth largest in the world. The city has residential quarters, temples, a palace and two pyramids in excellent condition. The astronomically-aligned 2.5-kilometre Avenue of the Dead bisects the city, beginning in the north with the Pyramid of the Moon and flanked by astounding pieces of ceremonial architecture. The showpiece along this route is the Pyramid of the Sun, the third-largest pyramid in the world at 65 metres high and 220 metres long. 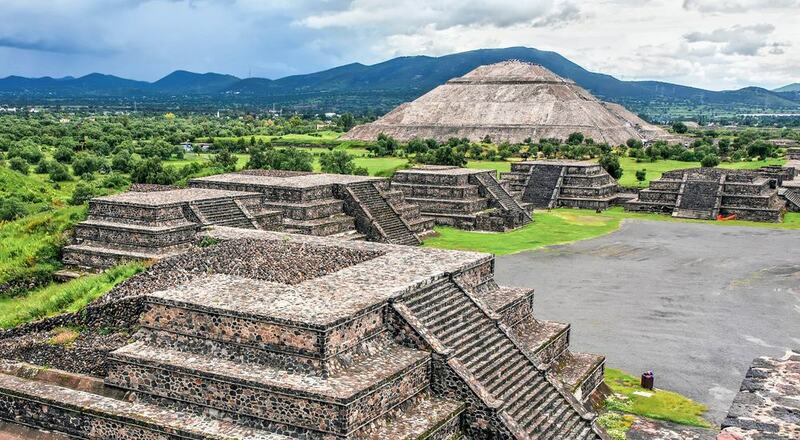 The photo opportunities are out of this world, and if you need to know more about the intricate configuration of Teotihuacan’s monuments it’ a good idea to book a guided tour. Back in Mexico City’s Historic Centre there’s a superb archaeological museum by the cathedral, close to the site of Tenochtitlan’s main temple. This was established in 1987 to showcase the discoveries made during excavations of the temple in the 19th and 20th centuries. The museum was designed by the esteemed architect Pedro Ramírez Vázquez and is purposely low-key to complement the colonial architecture of Zócalo. You can make your way through the excavated ruins on footbridges outside and trail through the eight themed exhibition rooms, displaying artefacts like stone masks, jewellery, flint blades, figurines, statues and ritual stones. These help explain all aspects of Aztec life, from trade and agricultural technology to gods and goddesses, religious rituals and sacrifice. This folk art museum opened in the Historic Centre in 2006 and champions traditional Mexican crafts like pottery, basketry, textiles, glassmaking, piñatas and alebrijes (colourful sculptures of mythological creatures). These pieces vary in age and origin and are arranged in five themed galleries. They trace the roots of Mexican art and of popular art, and also showcase everyday items, liturgical art and pieces that have been ascribed spiritual value. 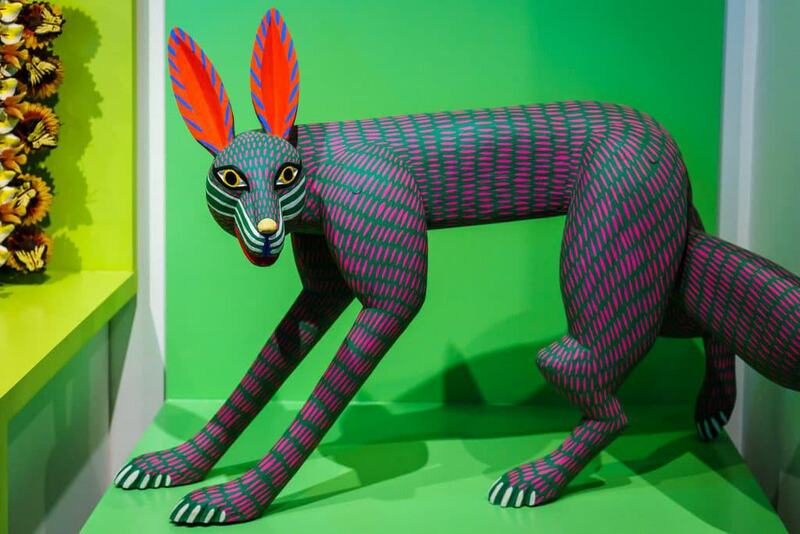 The Museum sponsors the Noche de Alebrijes, when quirky sculptures of mythological beasts are built on an enormous scale and paraded around the Zócalo. You can see a few floats from the parade on the ground floor. Day of the Dead is a well-known celebration falling around 2 November, and in classic Mexican style it blends western traditions (All Saints’ Day) with pre-Hispanic pagan culture. There have always been celebrations for honouring the dead at this time, but these were sometimes overshadowed by Halloween. In Mexico City something curious happened in 2015, when the opening to the Bond movie Spectre showed a procession in Mexico City that didn’t actually exist. And so the city organised its own parade, which in three short years has become a massive event. 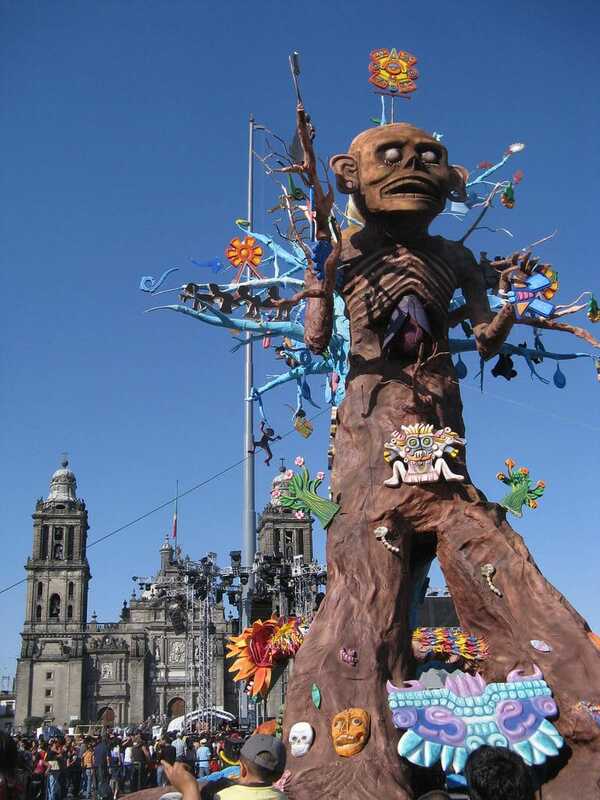 The 2017 procession down Paseo de la Reforma had a cast of thousands and was attended by 300,000 onlookers. If there’s a common motif it’s the skull, worn on daintily decorated masks and painted onto the faces of women dressed as La Calavera Catrina (the Dapper Skeleton). You’d need a whole article to scratch the surface of Mexico City’s street food scene, which is up there with the best on the planet. But there are a few basics to keep in mind. On the whole street food is something for the morning and evening. Breakfast time means tamales, which are steamed masa (maize-flour dough) pockets, wrapped in a corn husk or banana leaf and filled with fruit or cheese. 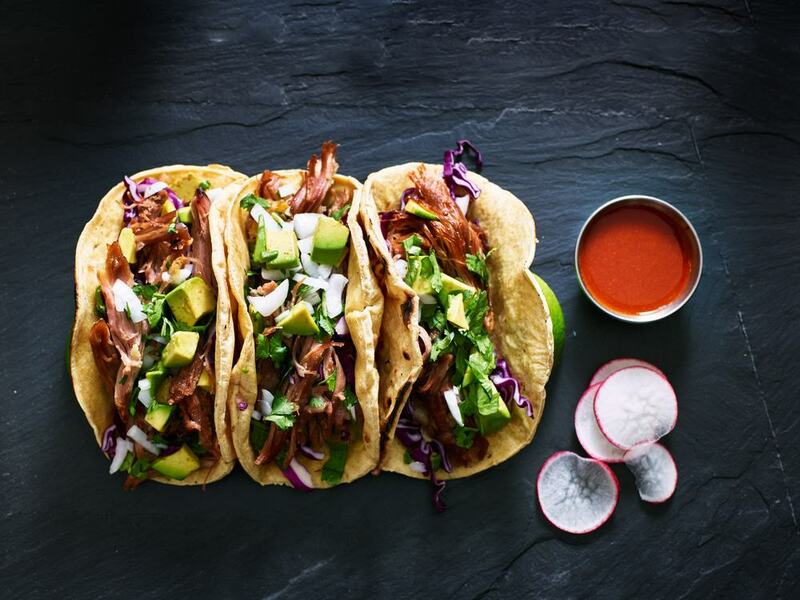 Later in the day, tacos, in small maize tortillas, have any number of fillings, like carnitas (simmered pork), chorizo, al pastor (kebab-style meat) or barbacoa (pit-roasted meat), garnished with some combination of onion, coriander, salsas and spring onion. Other picks from a multitude of choices are tortas, which are sandwiches with all sorts of different fillings, and quesadillas, fried tortillas filled with cheese, different meats, salsa, avocado, mushroom… as with most Mexican street food the variety is almost endless.